Robin Hood 2018 takes its inspiration from the classic legend Robin Hood but here the director Otto Bathurst tries to make it slightly different from the earlier versions. While the name of the protagonist and the storyline is kept untouched, the action and violence is taken a level up from the earlier versions. 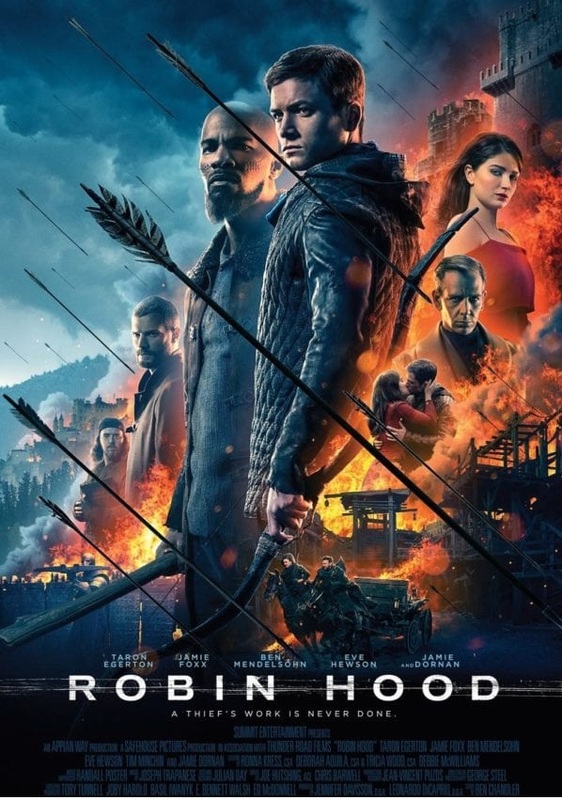 Robin of Loxely (Taron Egerton) comes home from the Call of Duty in Arabia only to find that the evil Sheriff of Nottingham has destroyed his mentor; his girlfriend (Eve Hewson) has married another person and he’s declared dead at the war. A determined Robin forms an army with Little John (Jamie Foxx) who also becomes his mentor. John is an Arab soldier seeking to avenge the death of his son by helping Robin. The poster wears a scary look with the dark background and fire-color front. It features Taron Egerton flanked by Jamie Foxx and Eve Hewson. In the bottom, Robin Hood is seen in action. There are many movies inspired by the character of Robin Hood but the 2018 movie sets a different tone. It portrays the legendary crusader in a modern way.